1. 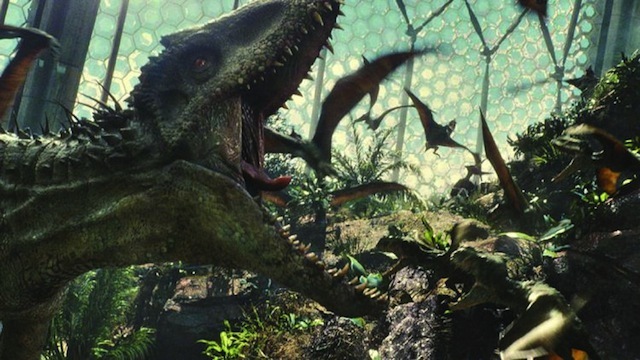 The Dark Impact of the $500 Million “Jurassic World” Weekend. “Jurassic World” shocked both audiences and box office experts when it raked in over $500 million last weekend. Grantland’s Mark Harris explores the dark impact of such a movie making that much money in our permanent franchise world. As much as I would like to sit in judgment of all this, the seat isn’t particularly comfortable — especially since “Jurassic World” itself anticipates and drolly comments on this new economy; it is literally, and knowingly, a cautionary tale about the perils of heedless brand extension, which may not make it the movie of the year but certainly makes it the movie of the moment. (Or at least an especially savvy exercise in preempting criticism with irony.) The film both grins and winces at the current excesses, compromises, and uncertainties of entertainment — jabbing lightly at everything from product placement to dependence on foreign financing — and a wincing grin feels about right. How, for instance, does one react to the “Transformers” idea? With an amazed hallelujah that any studio, in 2015, thinks that writers batting around story ideas is a better way to come up with a movie than marketers batting around release dates? Or with sorrow that this collective effort is going to be expended on perhaps the most witless and bombastic expression in cinema history of the belief that boys like making things go boom? Should one be happy that studios are finally realizing that the deep engagement of television’s audience is something to strive for? Or is it more appropriate to mourn the fact that what used to be the backbone of Hollywood moviemaking, namely self-contained, non-repeatable scripts, now threatens to become an anomaly, a charity act, a niche, a tithe to awards season, or a skippable option? 2. Andre Gregory and Wallace Shawn Discuss Their Years in Theater, Film, and Life. Criterion just released a box set of three Andre Gregory and Wallace Shawn films – “My Dinner With Andre,” “Vanya on 42nd Street,” and the more recent “A Master Builder” – which represents their collaborations together and an intersection of theater, film, and life. The Dissolve’s Noel Murray sits down with Gregory and Shawn, and they talk about their decades working together. Shawn: Jonathan Demme is a lot wilder and more prone to fits of inspiration, and he’s improvisatory. Louis was more systematic and careful. Jonathan Demme is a risk-taker. Louis spent months with us on “My Dinner With André,” so it was incredibly well-rehearsed in terms of how it would be filmed. He knew exactly what he was going to do before doing it, with a few alternatives. We had a three-week shoot. The first week was spent doing tests, and Louis tried out different ways he might want to move the camera. But he eventually abandoned all the experiments and tests, and there was very little movement of the camera. But he knew exactly what he was going to do. “Vanya,” he really couldn’t know, because the way we rehearsed with André, we did it differently every time. I think the filming of “Vanya” had more surprises in it for Louis, but still, he did try to do it in a sensible way, and was thinking of how he was going to solve the problems in the editing room while he was shooting it. Jonathan actually did something no director would do, and said we didn’t have to do it the same each time. We could do it from different angles in different ways. And I don’t know how he and the editor dealt with that. But when you see the movie, you wouldn’t know. Somehow, he channeled our spontaneity without making it look like it doesn’t cut together. 3. The Greatest Pie Fight Ever Filmed. Laurel and Hardy are one of the best, most recognizable comedic duos of all time, and now one of their best film scenes has been recovered. Their 1927 film “The Battle of the Century” features the “biggest, best, funniest execution of the pie-in-the-face gag” in film history, but unfortunately the second reel of the film which contained the gag has been lost for six decades, until today. Slate’s Matthew Dessem unpacks the gag, the lost footage, and what it means for fans of early comedy. 4. “Veep” Creator Armando Iannucci on Why He’s Leaving At the Right Time. “Veep” recently ended its fourth season on a cliffhanger: it’s election night for Selina Meyer and the results are an electoral college tie. But the fourth season’s end also signaled the end of creator Armando Iannucci’s involvement with the series. Iannucci, famous for his brand of banter and profanity on “The Thick of It” and “In The Loop,” brought an essential energy and tone to “Veep.” So, why is he leaving? The Hollywood Reporter’s Paige Phelan interviews Iannucci and asks him about the finale and his departure. Switching gears, after four seasons working on the show, why was now the right time to pass on the baton? As I was doing season three, I thought in my head that I had one more season in me. It’s two things. [First], it’s just the practicalities of flying backward and forward between London and Baltimore. As you get older, you think jet lag would become easier, but it gets harder, and when you find yourself on set practically falling over with exhaustion, you feel you’re not giving it your best (Laughs). Also, I’ve been doing “Veep” for four years, and prior to that doing “The Thick of It” in the U.K. for five or six years, so it felt like 10 years of doing a political comedy show, [so] it’d be good for someone else to inject some fresh energy and fresh ideas. When you are a showrunner and you’re in all of the show, four or five seasons is the maximum you can do before you start to feel a little bit — you come up with an idea and you say, “Oh hang on, we did that in season two. Oh no, we did that in season three.” You end up overcooking ideas, heightening [them] because you try to stretch things. I fired myself off the show. It shouldn’t be me doing the next [season]. I like the idea of going out on a high other than when you’ve exhausted it to its absolute final [breath]. This has been the strongest season so far, and it allows David to come in with this energy already there and the positivity already there. 5. The Gleeful Free-For-All of “Gremlins 2: The New Batch”. This week marks the 25th anniversary of Joe Dante’s classic sequel “Gremlins 2: The New Batch,” a rambunctious meta-sequel that by all accounts surpassed the original in terms of cult love. Movie Mezzanine’s Ian Barr examines “Gremlins 2” and its unique brand of absurdity. In 1990, Joe Dante reluctantly agreed to make a sequel to his 1984 hit “Gremlins,” under the condition that he was allowed free rein, and the result was an infectious mélange of movie madness, the one Dante picture that comes closest of all his films to capturing the spirit of that 1968 touchstone. The titular critters of his 1984 film were, like Jack Finney’s Body Snatchers, malleable in their metaphoric function. In “Gremlins 2: The New Batch,” they’re mainly uncontrollable figures of Dante’s id, allowed to wreak havoc on a not just a city, but also both the logic of the first film and the industrial logic that necessitated a “Gremlins” sequel in the first place. Of course, Hollywood sequels, remakes, and reboots that comment on the factors that produced them aren’t a particularly novel idea, but “Gremlins 2” might be the most sustained and productive example of the meta-sequel. It helps that it’s a children’s film — outside of “The Simpsons,” I can’t recall a work of narrative that was more conducive to my own burgeoning comprehension of irony or self-reflexivity as a young viewer. Twenty-five years since its release, and a few less years than that since I first saw it, it feels just as inspired — one of a handful of films (“Persona,” “Two-Lane Blacktop,” Jerzy Skolimowski’s “Le Depart”) to truly earn the right to employ the meta-textual effect of the celluloid projecting it burning from the heat of fictional rupturing.